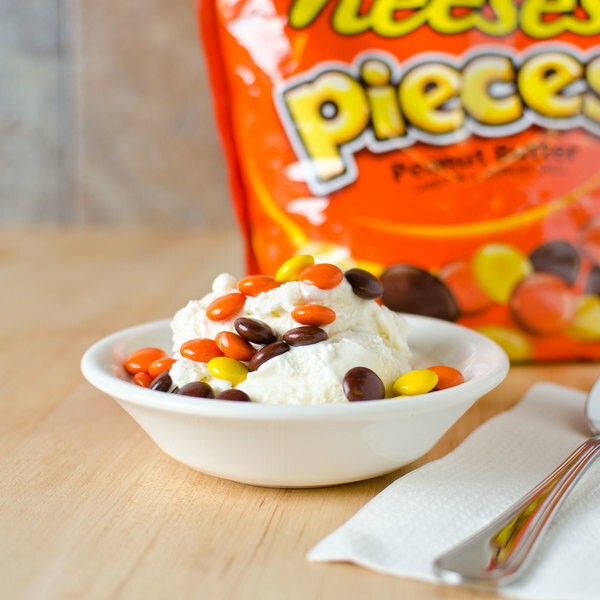 Create premium ice cream sundaes with this REESE'S PIECES© ice cream topping! 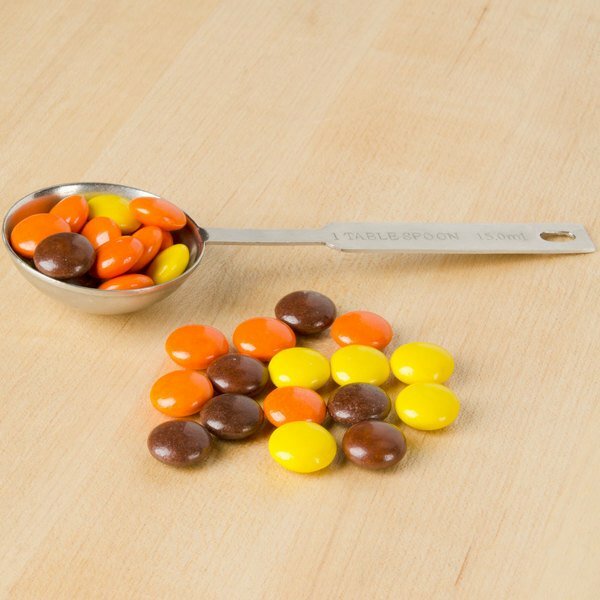 Owned by The Hershey Company, REESE'S PIECES© offers the smooth and creamy flavor of peanut butter wrapped in a crunchy, candy coated shell. 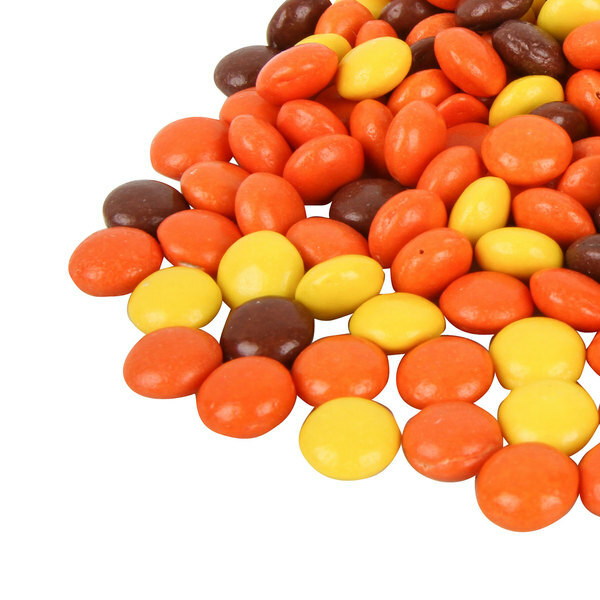 Make a REESE'S PIECES© flavored sundae or ice cream cake using these whole, round candy pieces. They're easy to sprinkle atop ice cream or blend into a rich and creamy milkshake. Featuring irresistibly sweet peanut butter flavor and classic yellow, orange, and brown colors, these eye-catching REESE'S PIECES© candies will enhance the appearance and taste of any dessert. Make sure to always have some on hand at your ice cream shop, diner, bakery, or restaurant! More than an ice cream topping, this REESE'S PIECES© topping can be used in your cookie batter to create deliciously sweet cookies. You can also use them as a fun and festive garnish for candy apples, cakes, or cupcakes. 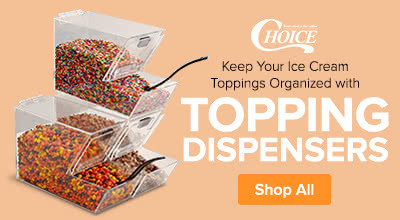 Offer them at your soft serve or frozen yogurt bar so your patrons can add just the right amount of flavorful ice cream toppings to their dishes. Whichever way you use them, these REESE'S PIECES© bring freshness, great flavor, and the assurance of a beloved, recognizable brand to your business. This is a huge bag of reeses pieces. This bag is a Great value here and they can be used in so many ways. Put inside other candies. Made in cookies. On cakes or ice cream or even eaten alone. Everyone loves reese's pieces! The best for fall coloring in desserts and baked goods. But definitely a crowd favorite all year 'round. The Reese's brand has mastered the salty-sweet balance to make their taste far surpass any competitors or generic brands we have ever tested. It is well worth seeking out their brand specifically, for the flavor alone. Not to mention also being able to include a brand name on your menu, which shows customers you care about details and quality and they are getting their money's worth. Your flavor will be so much better and more satisfying with the real deal. These are delicious and reminds me of the movie ET. We use this product for our ice cream sundaes as well as toppings for our donuts. Couldn't be any happier! While these are delicious, I recommend you buy them in bigger quantities on this website. They will save you a lot of money in the long run as these will fly off of your shelf. 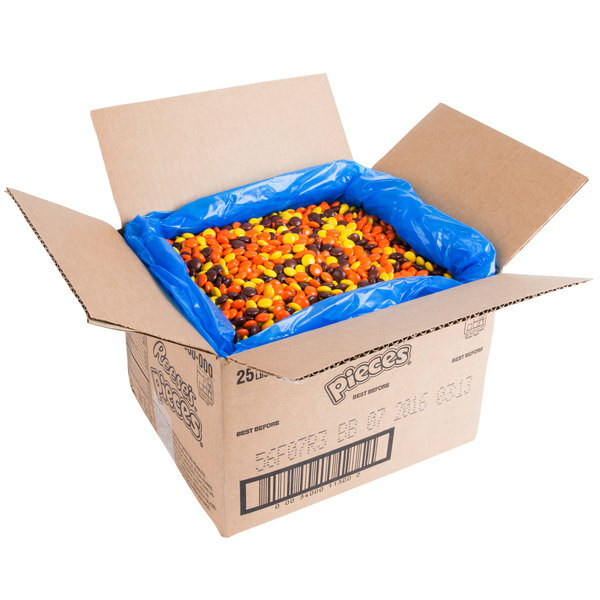 The REESE"S PIECES ice cream topping are a great buy and taste really good. The peanut butter and chocolate are great and makes for a really great tasting ice cream sundae. What more needs to be said for Reese's Pieces? This are literally the exact thing you would buy at a movie theater or convenience store. They arrive in a clear plastic sack. We put ours in a cookie jar and use as needed. They arrive in good condition, packed in a clear plastic sack inside a cardboard box. Enjoy. We weren't sure if these would show up as mini's since they're advertised as toppings, but they are the regular size. The flavor was just as it always is and our customers were happy with the product. We were a little surprised with packaging as we weren't sure what to expect but it was perfectly fine. (It came in it's own little box and was in a thin plastic bag that was knotted shut.) So if you order these be careful when opening and don't expect it in a sealed reese's trademark bag like you get at the store...it is bulk after all. Create your signature milkshakes with this Reese's Pieces ice cream topping. It is great as it will add an authentic flavor to all your recipes. A great peanut butter and chocolate topping for vanilla yogurt. The candy is always fresh when it arrives and makes a perfect topping for Halloween and fall baked goods. I am obsessed with this candy. It's one of my favorite movie theater candies by far. I love the crisp shell and the great peanut butter flavor. This is such a popular candy for any type of cake or cupcakes we do. People love it- and they are great as they do not melt during the hot months. We prefer the mini pieces better but these are just as good! Reese's Pieces are a great candy! I love the crisp shell and the creamy peanut butter inside. I use them in my bake shop in brownies, cookies, cupcakes and anywhere else I can put them. There is nothing that says, "chocolate" like REESE'S! I purchased these to place on top of peanut butter pies to create beautiful ambiance AND for our kids to snack on at school. They fit nicely and easily in their lunchbox. You can't go wrong at the ice cream shop supply when you purchase 5 lb. REESE'S PIECES® Ice Cream Toppings. We will be ordering more this is the perfect size for businesses. Reeses pieces are simply delicious. I use them in cupcakes, cookies, and ice cream. Highly addictive, eating handfuls at a time lol. Shipping was great, the box had ice packs to help with the heat. We use these on a daily basis. Our Reese's pieces are our most popular topping so we have to order a lot at one time. The 25lb box is the perfect amount for us. They never come melted or crushed. It's a really good product.